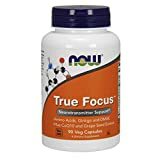 Now True Focus Review - Is this Supplement Safe? In this Now True Focus review, we’ll explore the benefits and drawbacks of stimulant-based cognitive enhancement. True Focus is a branded brain supplement which claims to improve mood and sharpen mental acuity. Of course, these are primary goals of many effective nootropic supplements. However, there are many different approaches to achieve these goals. Now True Focus seeks to spike the release of a few very powerful neurochemicals in order to produce temporarily heightened states of energy and concentration. Are there health risks involved in raising levels of dopamine and adrenaline for short periods of time? Our review of Now True Focus will cover product ingredients, potential side effect, and other ways of thinking about cognitive enhancement supplements. Read on to find out if this new “brain vitamin” is for you. True Focus contains an assortment of mild herbal compounds and common vitamins, such as grape seed extract, vitamin C, vitamin B6, CoQ10, Potassium, and Taurine. However, its star ingredients are L-Tyrosine and L-Phenylalaine. These 2 amino acids are most likely responsible for the majority of its cognitive effects. L-Tyrosine is a direct pre-cursor to the neurochemicals dopamine, epinephrine, and norepinephrine. These organic substances are primarily used by the body to rev up the heightened focus and amped up metabolism associated with “fight or flight” reactions. They are released when we need a sharp, intense blast of energy, such as in a time of physical crisis or great emotional stress. When these chemicals are released, we temporarily feel a strong degree of mental control. L-Tyrosine also supports the health of the glands which produce these chemicals, like the adrenals, thyroid, and pituitary glands. If you are deficient in this amino acid, it can result in feeling fatigued and lacking motivation or focus. Now Foods True Focus’ other main ingredient, L-Phenylalaine, is another amino acid which is thought of as an energy powerhouse. It inhibits the experiencing of physical pain and also synthesizes into additional dopamine, norepinephrine, and epinephrine. On its own, L-Phenylalaine can enhance mood and boost concentration, specifically in ADHD patients. Together in one supplement, L-Tyrosine and L-Phenylalaine increase the levels of fight tor flight hormones, for a short period of time which will enhance motivation, concentration and mental energy. While the Now Foods True Focus user will experience gains in concentration due to these hormone spikes, there is a downside that must be considered. Spiking dopamine too much may be followed by withdrawals and an experience of an energy crash after the effects have worn off. If you overuse this supplement, it could cause down-regulation of dopamine sensitivity, leading to tolerance and further problems. This is sometimes accompanied by sluggish energy, brain fog, lack of ambition, and depression. We see this type of spiking of dopamine and epinephrine in another type of pill as well – amphetamines. Those drugs work in much the same manner, giving the user a high “reward” from a short-term blast of dopamine, etc. When the drug runs out, there can be a hangover effect. The amounts of these compounds within Now True Focus are obviously not as strong as stimulants like Adderall, but the principle is the same. In effect, you are “tricking” your brain into feeling focused for a brief time, at a steep cost. A more progressive approach to cognitive enhancement looks at the total picture of neural health. Nootropics are a class of brain supplements that can help you improve your concentration using non-stimulant mechanisms of action. Of all the nootropics on the market today, none is more popular than Piracetam or Nootropil. A great nootropic supplement, like the widely used compound Piracetam, creates an environment of total harmony and efficiency in the brain. It does this by optimizing activity of the neurotransmitter acetylcholine which is involved in memory and executive function. Acetylcholine is the organic neurotransmitter which our brains produce to facilitate and regulate all forms of cognition. By supporting acetylcholine responses, Piracetam improves signaling (communication) within the brain from structure to structure. It fosters the healthy growth of neurons and the synaptic pathways between them. Piracetam is a derivative of GABA, the natural substance which calms over-firing nerve cells. While Piracetam is not itself GABAergic, many users have reported that it can calm mood and create a peaceful, relaxed mental state that is simultaneously vital and efficient. These effects are even more apparent with a stronger Nootropic like Aniracetam which is a cousin of Piracetam. Memory function is supported, and recall of facts is enhanced when using these compounds. The total effect of all of these mechanisms is the feeling of sharp thoughts and fluid intelligence. There is no comedown or hangover from this approach as opposed to taking True Focus. In fact, the more of a supplement like Piracetam you use, the more long term neuro-protective benefits you receive. While it appears to be a quality product, our Now True Focus review must conclude that there are healthier, safer ways to improve mental focus in the long term. It may be safe to use this supplement every once in a while, but it should not be taken on an ongoing basis. If you do decide to use Now Foods True Focus, consider stacking it with a nootropic that can assist in promoting better concentration, motivation and attention span. The tendency of Now True Focus to artificially spike hormone levels in the brain produces only short term gains which are followed by depletion and withdrawal. Taking a cognitive enhancement supplement like Piracetam, especially when it’s combined with choline, will build superior mental focus by creating thriving neural tissue. Anyone who is interested in improving concentration, boosting memory, and lifting mood is encouraged to explore what health-enhancing nootropics like Piracetam can do for them. At first I thought you review was just because you wanted to sell another product but now after using true focus for a month and now I’m having no motivation and depression. I originally got true focus to help with ADD which it did for about a month but now the negative side effects aren’t worth it. This is slightly idiotic. L-Tyrosine and L-Phenalylanine are natural amino acids that are acquired through diet. The blend definitely may not be ideal for an ongoing basis but it is however not harmful. L-Tyrosine and Phenalylanine allow the body to rebuild key neurotransmitters that govern motivation and purpose, which is Dopamine. By discontinuing True Focus you can simply use L-Tyrosine on it’s own and if you read a review on that yes it is a very MILD nootropic barely could be considered one as it is an amino acid, but that’s not a bad thing. At the end suggesting that Piracetam is a better alternative is simply LUDICROUS. How could one determine that a synthetic substance is in any way shape or form better for someones over all health than an amino acid usually found in food like Turkey ?